I believe that sharing the experience should be inclusive, fun and make you question what you've been tasting all along. Regardless of the technique you choose, the goal of tasting coffee is to think about what is tickling your senses. For a moment let's remove the topic of cupping or brewing - here's a chance for people to get out and see what coffees are out there in the world. We want to create an opportunity for everyone to slow down, smell, taste and chew through, think through all the flavours. Let's discuss the pros and cons another time. In December, we had an overwhelming number of coffees to flood our senses. The lovely Propaganda Cafe openly hosted us and a few keen people brought the coffees from around the world. We shared in a collective tasting and discussion. Here are some of the roasters and coffees. 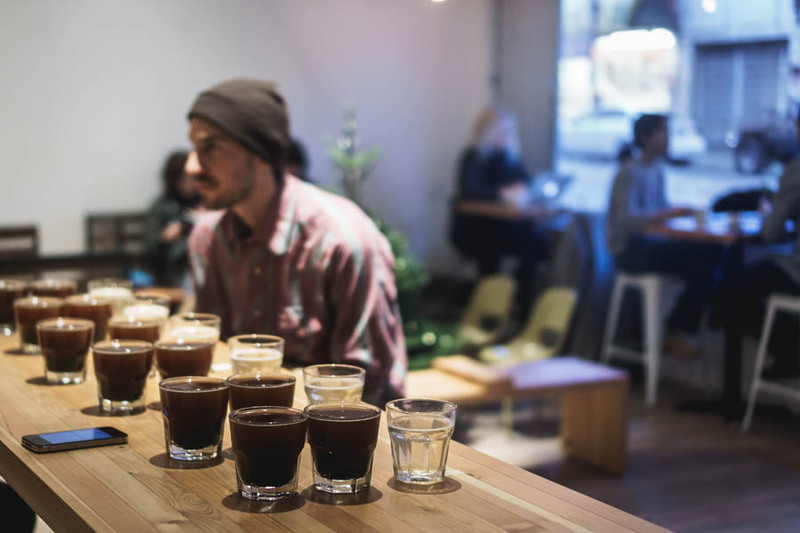 It's refreshing to be exposed to such a wide variety of coffees from local and abroad, it's helpful to keep us striving for better in Vancouver and the industry. I believe the more flavours one is exposed to, the greater he/she is able to be objective about taste. I believe that sharing the experience should be inclusive, fun and make you question what you've known all along. Let it not be alienating or a hoity toity 'fuss' about taste. Hope it makes sense... if not, dig deep. If you are looking for places to taste coffee Cafe YVR has a current list of cuppings <<here>> We hope to continue a trend of tasting and questioning in the coming months. If you're on board, want to host or offer coffee, get in touch! Tomorrow we will be broadcasting CoffeeFriends on Periscope at 11 am PST! !